For best performance, you need to be on a wired connection. If you are presenting remotely, you will want to wear headphones/ear buds to control feedback. You will need a webcam and microphone (usually on most laptops). There may be a prompt for a short initial install (so you will need admin permissions). If your connection happens to drop, you can simply rejoin the session by clicking it again. If you have time, it is a good idea to test your connection and run through the WebEx instructions before presenting. This will ensure that you know how to use the application and that everything is working properly. Join Webex meeting via the WebEx link provided by the instructor. The instructor will invite a student/guest to be a presenter by dragging the white/green icon to the left side of the student’s/guest’s name. 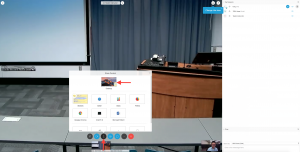 The student/guest can click on the Share Content icon and select the Desktop to share with the class. Unmute the mic before speaking. The mic icon is grey if it is unmuted. The mic will turn red if it is muted. The student/guest can locate the sharing toolbar by hovering over the top of the shared screen. Click on the Share option to share a file or application. Click on Stop Sharing in the sharing toolbar to hand over control rights to another participant or the instructor.